Growing up I always thought that I was kind of cursed with my last name. Long, at the end of the alphabet, and no one could ever pronounce it. I found myself spelling, explaining, and correcting people day in and day out. Finally I just started responding to every comical mispronunciation. Now that I am older, I have realized I there is so much behind the last name Strachan (pronounced Strah-awh-n, that's right there is a silent CH in my name) and I am truly blessed to have such a unique last name, because it represents my unique family. The name Strachan, and my family, can be traced back to Scotland, a place I never knew much about. I always dreamt of visiting the place where my strange last name originated, and this past weekend I got to do just that. On Thursday, I hopped a train from London to Edinburgh, where my Scottish adventure began and a smile never left my lips for the duration of the trip. After my four days in Scotland, I came to the realization that my ancestors are from the most beautiful place that I have ever seen and I am so lucky to have my crazy, complicated last name. My train arrived into Waverley Station on Thursday evening and my group and I checked into our hostel for the evening. Even though it was dark out, my friends and I didn't want to miss a beat, so we set out in search of Edinburgh Castle! I have a thing for castles and I 100% got my fix during this trip! I loved exploring Edinburgh (though short) during the bookends of my trip and it is such a cool medieval town with amazing architecture. Besides the castle, I peeked inside the cafe where J.K Rowling wrote Harry Potter, strolled through the Scottish National Gallery, and wandered through the cobble stone streets. The following day we began our adventure through the Scottish Highlands and it could not be more beautiful. This summer, I went hiking for basically the first time in Acadia National Park (read all about it here). I am so glad that I did this summer because if I didn't I would have been totally out of my comfort zone on this trip. Hiking through the Highlands was such an amazing experience, with beautiful scenery at every turn. My pictures don't do it justice! This castle is one of the most photographed castles in the world and I definitely know now why. It is so beautiful and is exactly what I think a castle would look like in my mind. Every site we went to in Scotland our tour guide would talk about different movies that had been filmed where we were. He talked about Game of Thrones, James Bond, and a bunch of other really cool movies. But I was SO excited when I got to Eilean Donan Castle and he said that the movie Made of Honor was filmed here! That is a movie that I love and I can picture all of the scenes that were filmed here, so this was super cool for me. Want to get married here like in the movie Made of Honor? It will set you back just 600 pounds a half hour! Legend has it that if you stick your face in this river for seven seconds, then you will be beautiful forever. It was wayyy too cold to even think about doing this, but some crazy members of my group did! Even though I might not be eternally beautiful, this river is! The river and mountains were so beautiful to look at and it was here that I genuinly appreciated the fresh mountain air (after having to breathe in London's for about two months!). This was one of the coolest things I have ever done (and I surprised myself every second)! This was such a long hike and I am for sure not an experienced hiker (my boyfriend can attest to it), but I made it work and powered through. The views along the way made every worry inside of my head worth it. On our way back to Edinburgh on Sunday, we made a pit stop in the town of Aviemore, a little ski and winter sports town nestled into the Scottish Highlands. It was here that I have some of my funniest memories of the trip! We stopped at a little lake beach played some soccer, reminisced about our amazing trip, and had a BBQ! Every summer my family and I head to the beaches of southern Maine and we can always be found doing something similar to this. Roasting marshmallows is also one of my favorites things, so I just loved everything about our end of trip beach BBQ! What do you think? 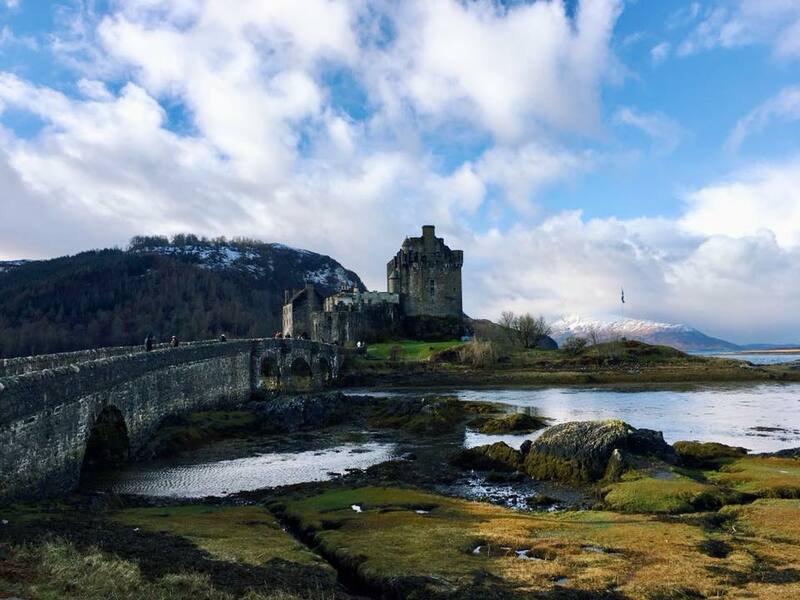 Have you started planning your trip to the Scottish Highlands yet? Leave me a comment below!